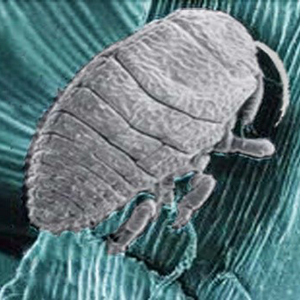 Biological control is the use of a living organism to eliminate or reduce a targeted pest. When the U.S. realized how important it was to control HWA, several exploratory missions were sent to hemlock forest in Japan and the Pacific North West to identify natural predators of HWA. A handful of predatory beetles that coevolved specialized feeding on HWA were chosen as biological control agents. The UNG Ecological Protection Lab primarily breeds two species of beetles: Lacricobius nigrinus (Ln) and Sasajiscymnus tsugae (St). Our lab, along with UGA and Young Harris, obtain a small amount of beetles each winter which we breed in the lab. These lab reared predators are then released into selected Hemlock Conservation Areas around North Georgia. Georgia has released nearly 1.4 million predatory beetles since 2004. HWA is never going to be fully eliminated from the area, but the goal is to establish the predators to keep HWA populations at levels that no longer cause hemlock mortality. This is a complex process that involves understanding the lifecycle and environmental variables that influence both HWA and the predator beetles. The optimum time, locations, and species of beetles being released is a major area of future research. 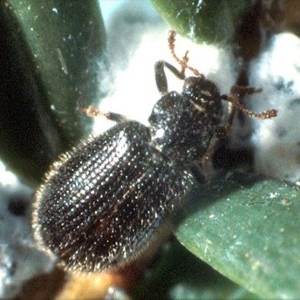 Lots of this research relies on conducting field surveys of predatory beetle establishment and hemlock health in order to learn what management techniques are working the best. There are two majors limitation to the amount of predator beetles our lab can produce. Hemlock branches with HWA must be brought back to the lab to feed the beetles, this is a finite resource that takes time and energy to collect. The initial populations our lab uses as breeding stock is also a finite and expensive resource. 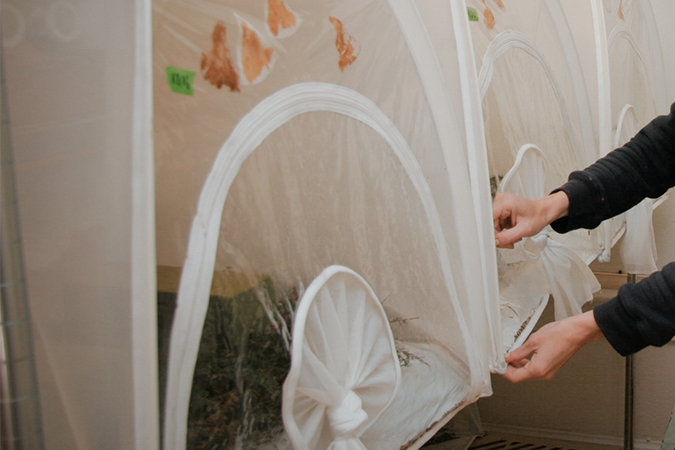 One tool being developed to tackle these issues is what researchers call a Field Insectary. 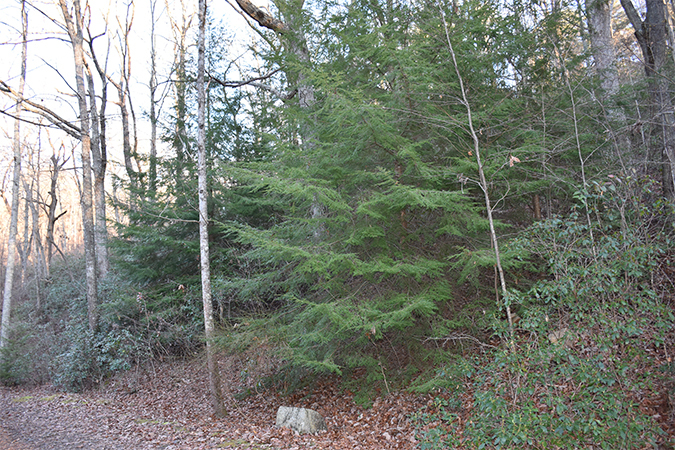 This is an ideal patch of hemlock trees where environmental conditions allow for both healthy trees and large HWA infestations. Several thousand predatory beetles are released into these areas, and then left to establish into even larger populations for several years. Eventually labs can harvest predatory beetles from insectaries, eliminating the need to collect and ship predatory beetles from their native ranges each year and increasing genetic variation of our breeding populations. A very productive insectary could even produce enough beetles, that labs could collect and redistribute beetles to other areas of forest, effectively allowing insectaries to do the rearing for us. 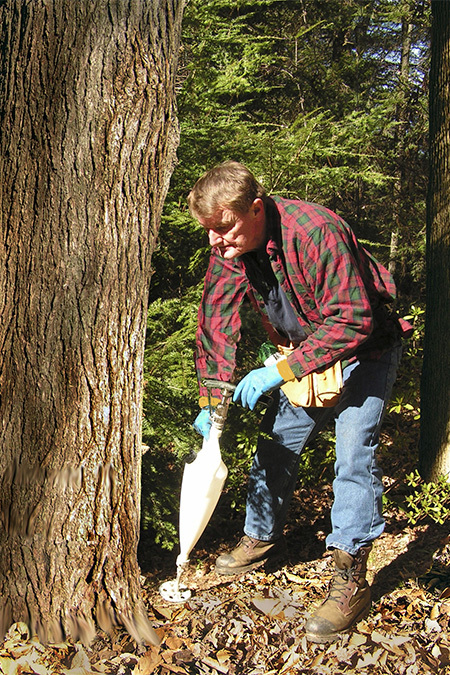 While biological control is the long-term solution, chemical treatment is a very popular way to protect hemlocks from HWA. One of the common chemicals used is Imidicloprid. It can be applied by anyone, but caution should be used as if not done correctly it can have unintended side effects. This is a broad spectrum insecticide that is long lasting in the tree. Treatment can be done by several methods, the most popular being a soil drench, or a tree injection. Treated trees should lose all HWA within a year and stay not infested for 5-6 years. Treated trees have been shown to continue showing increased health for up to 8-10 years after a treatment. Chemical treatment is a great management technique if you have a select number of trees you want to save. The main disadvantages is the immense cost and effort it would take to treat large numbers of trees, and the fact that trees would need to be retreated after a few years.